Australia’s regulatory agency has granted approval for the device, which prevents stroke caused by the treatment of carotid artery disease. InspireMD (NYSE:NSPR) announced on Wednesday (November 28) its CGuard Embolic Prevention System (EPS) received regulatory and reimbursement approval in Australia. The Therapeutic Goods Administration in Australia granted the product regulatory approval for the prevention of stroke caused by the treatment of carotid artery disease. The product has also launched on the same day through InspireMD’s distribution partner, Diverse Devices of Sydney. The device is an open cell stent wrapped in MicroNet mesh to provide continuous embolic prevention. With the specialized SmartFit Technology, the tapered version of this device is no longer needed. This approval adds to the company’s current European Commission mark for the device, which also has a pending approval application in Brazil. InspireMD expects to file the US Food and Drug Administration (FDA) investigational device exemption (IDE) sometime in mid-2019. James Barry, CEO of InspireMD, said this approval is important for the device’s expansion into new territories and the Asia-Pacific region. “With 22 million residents, Australia ranks third behind Japan and China in terms of total healthcare spending,” he said in the release. The device represents a need for safer treatments for carotid artery disease, which is differentiated from conventional carotid stents, Barry added. The MicroNet is InspireMD’s proprietary technology which is made from bio-stable mesh woven Polyethylene Terephthalate. It’s designed to trap and seal thrombus and plaque against the vessel wall to prevent blockages. InspireMD has demonstrated the device’s performance through seven competed and four ongoing clinical trials. In these trials, implanting the stent was successful nearly every time and patients had no ipsilateral lesions from 30 days to six months after the procedure. In the first half of the year, the company’s sales increased 65 percent while the CGuard EPS sales increasing 101 percent year-over-year, as reported in the company’s investor presentation. The company has raised US$18 million in capital so far this year, which is enough to move forward with the current commercial strategy. This includes the FDA IDE and other pipeline product developments. According to the World Health Organization’s most recent death report from 2016, stroke is the second leading cause of death globally. With 15 million strokes per year, five million are left permanently disabled, while another five million die. Surgeries to remove plaque and other material from the arteries to prevent stroke are invasive and often lead to heart attacks, damaged nerves or other complications. With many current stents, plaque protrusion still occurs in about 65 percent, from the status and type of stent, according to InspireMD’s company presentation. This could be prevented as the company’s technology permanently covers plaque and stops “debris” from going through the mesh. Based on this information and more, InspireMD expects this is a billion dollar market opportunity for its stent systems. Over the trading period Wednesday, InspireMD’s share price increased over six percent to US$0.22. 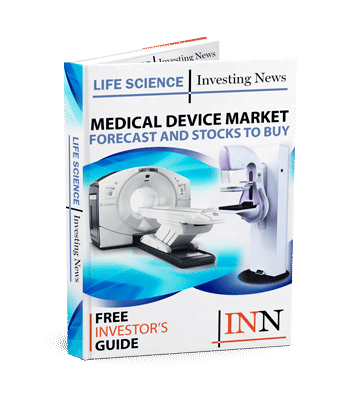 Investors interested in this medical device company can look forward to hearing about ample territory expansion for the CGuard and the FDA IND application in 2019.